We’d love your help. Let us know what’s wrong with this preview of The Castle Behind Thorns by Merrie Haskell. When Sand wakes up alone in a long-abandoned castle, he has no idea how he got there. The stories all said the place was ruined by an earthquake, and Sand did not expect to find everything inside torn in half or slashed to bits. Nothing lives here and nothing grows, except the vicious, thorny bramble that prevents Sand from leaving. Why wasn’t Stories don’t know everything. When Sand wakes up alone in a long-abandoned castle, he has no idea how he got there. The stories all said the place was ruined by an earthquake, and Sand did not expect to find everything inside torn in half or slashed to bits. Nothing lives here and nothing grows, except the vicious, thorny bramble that prevents Sand from leaving. Why wasn’t this in the stories? To survive, Sand does what he knows best—he fires up the castle’s forge to mend what he needs. But the things he fixes work somehow better than they ought to. Is there magic in the mending? Or have the saints who once guarded this place returned? When Sand finds the castle’s lost heir, Perrotte, they begin to untwine the dark secrets that caused the destruction. Putting together the pieces—of stone and iron, and of a broken life—is harder than Sand ever imagined, but it’s the only way to regain their freedom. With gorgeous language and breathtaking magic, Merrie Haskell’s The Castle Behind Thorns tells of the power of memory, story, forgiveness, and the true gifts of craft and imagination. To ask other readers questions about The Castle Behind Thorns, please sign up. Ever since I reached an age where Disney's Sleeping Beauty (which I adored as a seven year old) suddenly turned kind of eugh, what with the guy Aurora barely knew creeping up while she was asleep and kissing her, I have wanted a sleeping beauty story with all the elements but no eugh. This book comes pretty close to being what I wanted. Haskell creates an alternate Renaissance era France, with magic as well as miracles existing uncomfortably side by side (as these did when Philip Melanchthon, Mart Ever since I reached an age where Disney's Sleeping Beauty (which I adored as a seven year old) suddenly turned kind of eugh, what with the guy Aurora barely knew creeping up while she was asleep and kissing her, I have wanted a sleeping beauty story with all the elements but no eugh. Haskell creates an alternate Renaissance era France, with magic as well as miracles existing uncomfortably side by side (as these did when Philip Melanchthon, Martin Luther's heir, dedicated his entire life to fashioning a Unified Field theory that reconciled religion, science, and magic), and gives us a blacksmith's boy named Sand, who wakes up in a fireplace after praying to his patron saint for help. He finds himself inside the sundered castle, surrounded by deadly thorns, alone, with everything around him either shattered or dead. What he does, how he finds his companion, a difficult young aristocrat named Perrotte, and what they do together to deal with their dilemma, figure out the mystery of how they got there, and make their way to friendship, forms the rest of the story. Haskell is her best with relationships. It's sheer delight, watching the young characters navigate emotions and comprehension, especially of adult motivations. The themes of forgiveness and the nature of miracles breathe awe through the story. If at times it strays into bits of modern-sounding feminist rah rah, those are brief, and go a long way toward redressing some of the preaching about purity and passivity in tales of yore. I very much wish I'd written this up as soon as I finished it, because just about every element worked so well and I'd like to be able to do more than a list of "this worked for me, and this worked, and oh, hey, this worked!" I was pretty well hooked from the opening which had lovely echoes of the opening of Patricia McKillip's Song for the Basilisk. I was very taken with the idea of Sand's careful and painstaking rebuilding of bits and pieces of the ruined castle in which he found himself - both a survival story of sorts, and more. I loved the unexplained magic in the castle, and the way the story gradually grew to encompass historical setting outside the castle too. Perotte's awakening (from death, not sleep) was eerie and her growth as a character and in the friendship she and Sand build was wonderful too. The saints were one of the more different and surprising elements of a book that was altogether different and surprising. More than anything else, though, I was completely won over by the treatment of forgiveness and how hard it is to bring yourself to forgive someone who has done real wrong. For all this is a children's book, I remember discussions in a divorce support group with people struggling in the same way with the concept of forgiveness; quite a few were stuck thinking that forgiving the ex who had betrayed them would be another loss instead of a gain. Both redemption and the ability to forgive someone else are hard, tedious work, and I loved how that was shown here, without there being anything "messagey" in the book. This is not a magical adventure. This is a book about the journey of two teens, and by journey, I am referring to a journey of the heart. And no, I am not talking about romance. Forget about romance. This is a book about faith, forgiveness, and friendship, a story unlike any other I've ever read! Also I wouldn't place this book in the so called middle grade "box". This is a very slow book, with characters that despite their young age (thirteen) _when compared with today costumes _ feel mostly grown up, in a setting that is firmly set in the Middle Age. I would prefer to place this book in the historical fiction shelf....right beside the literary fiction one, and close by to the one featuring the magical realism....while trying to ignore the Christian shelf....because despite the Saints, and the "faith thing", I really don't want to go there. It's a complicated thing, trying to define this book....Oh, and there's this tiny bit that could be considered a fairy tale retelling! Ah! Slow. Really slow, because I for one, am not that interested in seeing someone just trying to repair and mend broken items! Here's the thing: Sand our main character, one day finds himself in the interior of an abandoned castle. He has no idea how he got there. He can't leave, because the castle is surrounded by the most vicious thorns known to man, and he has no idea what to do! No one is going to save him, and everything inside the castle is broken to bits. Even things that shouldn't be, like leather for instance. Story is, twenty five years ago there was this earthquake, and the castle was abandoned...in more ways than one. Bit by bit, Sand _ whose father and grandfather are both blacksmiths_ is able to put the castle's forge to work, and he just starts fixing things...in a very "unmagical" way. Forget about this book's cover, and the ax on the boy's hand. Forget about the vivid colours that you see in it! Sand finds himself in a place where nothing grows or lives. A place that must have been stage of such a terrible thing, that even the ground, the chapel, and the tombs inside were split apart. There he finds the body of a long dead girl. She's on the ground, outside of her broken tomb. Sand knows he can't leave her just like that, so he tries to put her "to rights" inside her tomb...and then he gets the hell out of there...as normal people would do! What follows next takes a little patience to read. I can't say that all the descriptions are engrossing and page turning! This is not an action...movie/book. However this is extremely well written, and after awhile I did become fascinated with the story. Probably about the time the dead girl comes to life (that or the falcon! )...and I am not talking about zombie alive. "Perrotte had never been a good sleeper, and maybe that was why she lived again. Death was the ultimate night, and she couldn’t keep her eyes closed even through that." You would expect there would be a whole lot of drama, due to suddenly seeing a dead girl come alive, right? Wrong. With time the blacksmith's son, and Perrotte, who was once the daughter of a Countess, become friends. This one, I am glad to say, that despite having two very active Saints _long story _ and the fact that one gets a....you know dead girl/bird rising plot, which can be constituted as a miracle, or just some very strong magical realism setting, never did that! I never felt that I was being lectured! The characters felt real, and likeable (well after awhile...but the girl had her reasons), and not some "goody too-shoes" that just end up behaving like idiots...and liars! Thank you. It just felt natural due to the time setting. So, yes, despite what I saw as a slow start, I really, REALLY, ended up enjoying this book, and I think that this is going to be one of those whose reads, that will just keep getting better with constant re-reads. So, grown ups! You, who like "a bit of the odd" in your stories, what are you waiting for to read this book? Merrie Haskell is one of those authors that always surprises me. I have gone into each of her three books expecting one thing, and getting something entirely different. Is The Castle Behind Thorns a retelling of "Sleeping Beauty"? Yes. But it is a throughly unique and different take on the story. And I adored it. This is a review of an ARC received from the publisher in exchange for a fair review. This is a quiet tale, one that unfolds slowly. Sand spends a large part of the opening completely alone, isolated from the world in the castle trying to figure out a way to survive. He is inventive, clever, and hard working. He is also lonely and talks to himself. These chapters didn't seem to move at all slowly to me though. The language is so beautiful and Haskell is building the mystery even as she allows the reader to get to know Sand and what he is about before she brings in the other central character, the magically awakened princess. Perotte awakens remembering she was dead. Not asleep. Dead. She pulls herself into the light of day and Sand's path, and the two of them, after a rocky start, begin to piece the castle and her story together. Perotte comes off as a spoiled and indulged brat at first, but her behavior quickly changes as she realizes how unfair she is being. As the weeks pass her and Sand develop a deep friendship and connection. But there are parts of Perotte's past she wants to keep locked away and not remember. Unfortunately she needs to confront them if they are ever going to defeat the magic of the thorns and get out of the castle. The story here is wonderful. I love political intrigue and there is quite a bit of that, but most of all it is a tale of friendship, perseverance, and the power of forgiveness. What I loved about the forgiveness aspect is that it is not about the power to affect the forgiven, but the forgiver, that release that comes from letting your anger and bitterness go so that it no longer consumes you. The way Haskell wove this into a thoroughly original retelling of a fairy tale makes this my favorite "Sleeping Beauty" retelling of all time. I honestly don't have much to say; I thought this was good, and the tone well done, and Sand's horror in particular communicated very well - but I also thought the novel's setting, its sense of place, was a little confused. This is a real medieval fantasy setting, with magic and castles, and yet it's got a bit of actual history and religion as well, and I didn't find the two to be particularly well integrated. And the ending rubbed me the wrong way, but that could be my biases, and no fault of th I honestly don't have much to say; I thought this was good, and the tone well done, and Sand's horror in particular communicated very well - but I also thought the novel's setting, its sense of place, was a little confused. This is a real medieval fantasy setting, with magic and castles, and yet it's got a bit of actual history and religion as well, and I didn't find the two to be particularly well integrated. I've been eyeing Ms. Haskell's books for a while now, since most in my circle seem to genuinely enjoy her work. For The Castle Behind Thorns, I was expecting a fairytale adventure with some sneakytimes and maybe an itsy bit of romance. I didn't quite get what I was expecting, but neither did this book disappoint. As the synopsis promises, the book starts when Sand wakes up inside an abandoned castle that is split in half. Literally everything from the cabbage in the kitchen to the stuffed hawk in the hall to the walls of the castle itself have been ripped in two. According to local legend, the castle was ruined in an earthquake a quarter-century before and has remained guarded by vicious thorns and neglected by the townsfolk ever since. But as Sand starts to wander through the empty, echoing halls, he also begins to question the stories he's been told. What earthquake could rend literally everything, including the solid iron anvils in the castle forges? How is it that none of the food has rotted and yet nothing else lives within the walls after twenty-five years of neglect? Who is the dead girl in the castle crypt? And why do the monstrous thorns guarding the gates seem to attack him when he tries to leave? I'll admit, not a lot happens in the first part of the book. Most of the beginning is Sand puttering around and fixing things. We see him learn how to draw water from the well without a bucket (rope and cloth balls), how to mend various metal things, how to patch up a broken taxidermy falcon, etc. It may not sound terribly interesting (and may not be for some people), but I enjoyed myself. I felt like I was learning useful things, the same way I felt while watching Lynn survive in Not a Drop To Drink. On the whole, I found the story interesting. Though technically a middle-grade novel, Ms. Haskell treats her readers like adults. She tosses out asides like Perrotte is "like the rock she's named after" without any hand-holding or further explanation. She expects readers to guess that "perrotte" is a derivation on a type of rock and to do research on their own time if they have any further questions. It reminded me of Seraphina and its love of houppelandes and other undefined objects. Ms. Haskell also does a great job of keeping the story and characters at a very astereotypical half-step off from my expectations. It felt a bit like listening to the National Anthem in minor chords (which you should totally listen to if you haven't already). I could follow along. I felt like I knew what was going to happen next, and for the most part I did except for when the tail end of one scene or another would take a quick twist away from my expectations. Like I said, I enjoyed my time with Sand and Perrotte. I was content to watch them as they tackled questions about forgiveness, mending, and imagination. I liked learning about the stars and appreciated the balance between the two very different stepmother characters who affect the story. That being said, it's not a story I missed when I was finished, nor do I have any desire to return to the castle. The characters played their part well and I rooted for their success, but I had no real attachment to any of them. The Castle Behind Thorns ended up being a forgettable, middle-of-the-road book for me, but there were enough things I truly enjoyed about Ms. Haskell's writing that make me eager to try her again, so I count this adventure as a moderate success. Points Added For: Sand not being a fluent reader, Sand preferring manual labor and craftsmanship over schooling, the historical context, Sand's stepmother, the practical mending advice. Points Subtracted For: Not fully connecting me with the characters, being a little slow, the ending being a little too soft. Good For Fans Of: Shannon Hale, The Secret Garden, historical fairytales. Notes For Parents: Murder (not graphic). Reading is a weird, personal experience. Likewise deciding what to read. Once I’ve settled on a book (enticed by the cover art, title, summary, author or the recommendation of someone I trust) my strange behavior escalates. I tend to avoid (or at best, skim) reviews of the chosen book. And after I’ve made a decision not to spoil a book for myself, years may go by, I may even change my mind about reading it, and still steer clear of reviews. It’s slightly obsessive behavior, but it’s just standar Reading is a weird, personal experience. Likewise deciding what to read. Once I’ve settled on a book (enticed by the cover art, title, summary, author or the recommendation of someone I trust) my strange behavior escalates. I tend to avoid (or at best, skim) reviews of the chosen book. And after I’ve made a decision not to spoil a book for myself, years may go by, I may even change my mind about reading it, and still steer clear of reviews. It’s slightly obsessive behavior, but it’s just standard operating procedure. So: The Castle Behind Thorns. I loved Merrie Haskell’s middle grade debut The Princess Curse, but her following book, Handbook for Dragon Slayers, didn’t strike my fancy. Still, I’ve been waiting on this third Haskell title since last year, but I’ve been pretending reviews didn’t exist. I didn’t even let myself dwell on the summary. Once I started reading, though, it was all enchantment, and I hardly looked up until I’d finished the book. Eee! I got an ARC! You might think from the title that this is a retelling of Sleeping Beauty, but like all of Haskell's novels, despite the fairy tale inspiration, it's a far more complex story that leans solidly upon history and is better regarded as an original fantasy tale. I had a moment of déjà vu when I started reading this, because the first line felt so much like Patricia McKillip's Song for the Basilisk, in which a boy is hiding in a fireplace, so desperate to be overlooked that he think Eee! I got an ARC! Sand woke, curled in the ashes of a great fireplace. The similarities end pretty swiftly, though (although it's far from a bad thing to be compared to McKillip in my book; and I'm extremely fond of both writers' works). Where Basilisk feels haunted and melancholy, Sand isn't himself born of a tragedy, although he is surrounded by one. He sneezes upon climbing out of the fireplace--where he has no recollection of falling asleep in--and explores the abandoned Sundered Castle where he finds himself. And by "sundered," they mean it: everything in the place has been broken apart, which his father ascribed to an earthquake a few decades ago. Nothing's been spared. Mixed with the mantel's splinters lay the shattered crest of a great family, their gilded phoenix and silvered swan once entwined, now separated and dismembered. Even loaves of bread. And apples. Even bedsheets have been ripped apart, and when Sand explores the crypts, he finds the body of a girl tumbled from its tomb. If you'll forgive me the digression, I adored the first half of the movie WALL-E, which had no dialogue at all. I grew less enchanted when people arrived on the scene, which probably says something about me. Yes, it was necessary for the plot to move forward, but I would've been happy just watching WALL-E trundle about the unpopulated Earth for the entire film. After Sand explores the castle and discovers he can't leave, he sets about putting it to rights. I can't call his attitude cheerful, exactly, but he's so earnest about his efforts that I couldn't feel hopeless about his situation at all, or even overly annoyed at the lack of information--how'd he gotten there? What had happened to the castle? Why were foodstuffs dehydrated husks rather than rotten entirely (a good thing for his nutritional needs)? Furthermore, it turns out Sand's father is a blacksmith, and Sand uses the broken half of an anvil to repair metal objects. This sort of crafting in fantasy makes me swoon (see the Recluce Saga). I loved this part: Sand's practicality and steadiness, and even the introduction of a couple of companions, a falcon and a girl (whose way of entering the story and the impenetrable castle made me positively giddy with delight), didn't interrupt my enjoyment. Sand and the girl, Perrotte, share their histories and navigate their differences, building a deeply satisfying friendship. There's a point when Perrotte must face a terrible memory, and Sand is desperate to try to mend it for her, the way he's been fixing everything else in the castle; his attempt was among the more poignant moments of the book for me. Inevitably, the external world intrudes, and, well, see my notes about WALL-E. Although the characters possess some wonderful relationships with other people--Sand's stepmother, for example, is awesome and not evil at all--I was less convinced by some of the politics and intrigue that start stirring up interest in the castle and its occupants. The conclusion felt slightly anticlimactic, with important resolutions worked out while sitting on stools in a tent, although I give credit to Haskell for not tying everything up with a gigantic fluffy bowtie of unrealistic lalala-everything-is-happy-the-end. I wish there were more Merrie Haskell books to read! Full review to come. I LOVE this series, and I am so sad to say goodbye to the castle. Um, perfect medieval story about mending, friendships, survival, and now to live properly. Also, smithing. I was lucky enough to read a manuscript of this one, and I absolutely fell head over heels in love with it. I can't wait until I'm able to share it with everyone I know. This story began with a boy named Sand waking up inside an abandoned castle. Without knowing how he got inside the castle, Sand attempted to leave but the thorns surrounding the castle attacked him, making him feel irritated, annoyed and desolated. With all exits blocked by thorns, could Sand manage to survive long enough before someone came and rescued him? I was so glad that this story wasn’t about Sand waiting for people to come and get him out of a bad place. Sand was in distress but he didn’ This story began with a boy named Sand waking up inside an abandoned castle. Without knowing how he got inside the castle, Sand attempted to leave but the thorns surrounding the castle attacked him, making him feel irritated, annoyed and desolated. With all exits blocked by thorns, could Sand manage to survive long enough before someone came and rescued him? I was so glad that this story wasn’t about Sand waiting for people to come and get him out of a bad place. Sand was in distress but he didn’t dwell in his bad moods. He worked out ways to get himself food and water and he used his skills as a blacksmith to fix things up so that he had tools to help him survive. I liked that he didn’t mind getting sweaty and dirty to do some hard work. When he saw broken items, he didn’t just discard them. He used his imagination and then turned these seemingly useless items into something useful. I also liked that he was sensible. He had a quiet determination to make the best out of his situation. Even when there wasn’t much for him to feel appreciative about, I liked that he focused on the good and not the bad. Perrotte, the lost heir of the castle, was a different story. She carried a lot of rage and all she could think of was to punish those who had wronged her. But with Sand patiently helping her get through her pain and sorrow, she started seeing life a little differently. I liked how the growth of thorns was tied to her (and Sand) in its intricate way and it’s wonderful to see how Perrotte made her choice in the end to make the thorns go away. Delightfully imaginative and beautifully written, The Castle Behind Thorns is a story that offers good, profound messages for both kids and adults. I think this one will soon become a favorite among libraries, schools and book clubs. Look out for this title when it’s released in May 2014 – highly recommended! I love a good fairytale retelling as much as the next person, but what I really don't like is when an author writes one and then doesn't acknowledge that he or she has done so, choosing instead to pretend that what is so obviously a retelling-- or maybe more accurately, a reinterpretation-- is truly original. A simple cursory browse through the Internet will show that "Sleeping Beauty" was originally French. So all of the references to France pinpointed the story to it's origins, as did many oth I love a good fairytale retelling as much as the next person, but what I really don't like is when an author writes one and then doesn't acknowledge that he or she has done so, choosing instead to pretend that what is so obviously a retelling-- or maybe more accurately, a reinterpretation-- is truly original. A simple cursory browse through the Internet will show that "Sleeping Beauty" was originally French. So all of the references to France pinpointed the story to it's origins, as did many other elements such as the thorns and the "sleeping" girl. There was no mention in an author's note or anything to give light to her obvious inspiration and I thought that was more than a little annoying. The references were just too obvious to me to be ignored and should have been acknowledged, even just listing the original tale as an inspiration in an author's note. Mweh. I'm a bit underwhelmed.. I liked the idea, but it was a bit too long for the plot. The characters development was not bad (which was a good thing, since Perrotte wasn't very likable in the beginning) Review will follow. I read Marie Haskell's The Handbook for Dragon Slayers several years ago when it first came out and loved it. In fact, it became one of my favorite books that I read that year. It made me even more excited to read her newer book, The Castle Behind Thorns. I got a copy before it was released, but just now found the time to read it. I wish I hadn't waited so long. Once again, the author did not disappoint me. I greatly enjoyed the book. I will admit, I found the beginning of the book very slow-pace I read Marie Haskell's The Handbook for Dragon Slayers several years ago when it first came out and loved it. In fact, it became one of my favorite books that I read that year. It made me even more excited to read her newer book, The Castle Behind Thorns. I got a copy before it was released, but just now found the time to read it. I wish I hadn't waited so long. Once again, the author did not disappoint me. I greatly enjoyed the book. I will admit, I found the beginning of the book very slow-paced. I think it's because the reader learns alongside with the main character what is happening. It can make things confusing at first. It was also hard to figure out how much time was passing in the castle during the book. However, once I got a couple chapters into the book I found myself loving it. I couldn't put it down. I love the way Marie Haskell weaves a storyline. It was like pure magic. It brought back a sense of nostalgia from reading some of my favorite medieval fantasy books when I was a kid. She brought back a sense of wonder that I haven't had while reading a middle grade book in quite a few years. I also loved the characters in The Castle Behind Thorns. I love how smart and creative Sand was. He didn't just lay in the fireplace and give up, which I'm pretty sure is what I would have done in his situation. It shows younger readers that if you just use your imagination, you can persevere through anything. At first, I wasn't sure about Perrotte. However, by the end of the book I loved her as well. Even after everything she went through, she was able to adapt to change and learn new things. I love when middle grade books have strong characters, and both of these characters are some of the strongest I've read in middle grade fiction. Meet Sand. He wakes up all alone in fireplace of a broken castle surrounded by thorns, with no idea of how he got there. He's seen the castle, of course, but nobody really notices or cares about it. But now he finds himself trapped. The castle is frozen in time, it seems. Everything is broken in half, but no rot or decay has touched anything... so the good news is, he won't starve anytime soon. Though he does fear that he will eventually grow tired of turnips. A blacksmith-in-training (not an of Meet Sand. He wakes up all alone in fireplace of a broken castle surrounded by thorns, with no idea of how he got there. He's seen the castle, of course, but nobody really notices or cares about it. But now he finds himself trapped. The castle is frozen in time, it seems. Everything is broken in half, but no rot or decay has touched anything... so the good news is, he won't starve anytime soon. Though he does fear that he will eventually grow tired of turnips. A blacksmith-in-training (not an official apprentice, because Sand's father wants to send him away to University, though Sand has no desire to do anything but become a blacksmith), Sand first works out the necessities to survive (food and a method of retrieving water from the well without a bucket) and then begins to set to work mending things in the castle. This book was so good. I had no idea what was going to happen next. I was hanging on every word, aching to discover the secrets behind the breaking of the castle right along with Sand. I enjoyed the relationship between Sand and Perotte (who shows up in the castle and adds to the mystery) and how it developed into a truly beautiful friendship. I really enjoy that this author manages to consistently write stories that involve boy-girl friendships without needing to hint at a romantic thread. This is a very sweet friendship story. 4.5. A bit of a slow start, but I liked this, as I always do when it comes to Haskell's works. A truly great fantasy story! So glad it caught my eye at the library. I like the concept but for me, it wasn’t completely satisfying how things are explained. I do like the characters and how things progress slowly but intensely. Finally! A different kind of fairy tale ~ I'm enchanted! Merrie Haskell writes wondrous middle grade fiction and her newest offering, The Castle Behind Thorns, is just as readable and evocative as the other two. Like her previous novels, The Castle Behind Thorns, too, retells, in its own way, a fairy tale, this time Sleeping Beauty. It is a direct retelling as Haskell chooses which elements of the “original” story she wants to tell and which one she wants to either get rid of or subvert. The story begins with Sand, an aspiring blacksmith, waking up in Merrie Haskell writes wondrous middle grade fiction and her newest offering, The Castle Behind Thorns, is just as readable and evocative as the other two. Like her previous novels, The Castle Behind Thorns, too, retells, in its own way, a fairy tale, this time Sleeping Beauty. It is a direct retelling as Haskell chooses which elements of the “original” story she wants to tell and which one she wants to either get rid of or subvert. The story begins with Sand, an aspiring blacksmith, waking up in a fireplace in the castle behind the thorns. The story is set in the French countryside which is the location of the castle. As Sand walks around taking inventory of everything remaining in the castle that has been in the background his entire life, he finds out that everything in the castle has been sundered. Torn in two. Even the small thing has been halved. Nothing grows in the castle or gets older. But what Sand doesn’t know is that as walks around, he is changing things. Sand is effectively trapped in the castle because the thorny bramble refuses to let him pass and when the long dead princess of the castle, Perrote, comes back to life, Sand’s predicament becomes even more dire. There are many reasons to love this book but I think for me the biggest reason is the strength of the narrative. If I had to elaborate on it, I would say that there is a quietness about the story; there is no melodrama to the lives Sand and Perrote lead. There is beautiful introspective quality about the novel that I find difficult to articulate. Sand grows as a person, finds his limits and then surpasses them. His desire to be a blacksmith is against his father’s desire for him to be a scholar and in the vacuum afforded to him by the isolation of the castle, he is able to understand his father. Haskell captures Perrote’s fey quality perfectly and in her reflections about death and what it meant to not exist, we learn what it was to exist. She, too, comes to terms with who she was and how she was. Perrote’s personality subverts entrenched ideas about what a princess is and should be like. However, Haskell constructs Perrote as more than an opposite to what Disney says fairy tale princesses are like; instead, she is an engaging mix of young and old voices. Her vulnerabilities are relatable as are Sands. Their friendship, when it finally solidifies is satisfying and though there is no romance, there is a definition potential for it and we do see glimmers of it by the end. Nothing overt but just a hint. I’m actually a giant fan of Fantasy Middle Grade, so hearing about The Castle Behind Thorns made me ecstatic. Especially with “secrets and a dark history.” Secrets indeed!The magic in this story is vivid and creative and completely original. 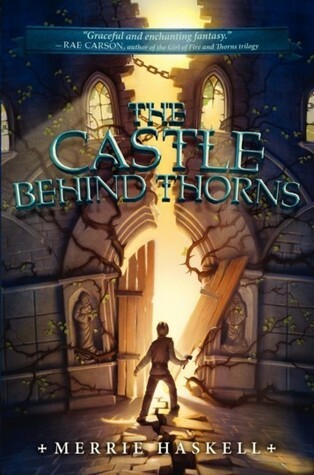 I loved the story behind the castle behind the thorns and I loved the haunting mystery. Right from the start, there’s a sort of curiosity in the atmosphere and you can’t help but get caught up in the story. Literally everything is split in half, or at least broken, and all the food is dried up instead of rotted and spoiled, and it just makes everything a bit more…enchanting and magical. I was almost obsessed with figuring out the why and how behind the magic and, in the end, the why and how were unbelievably enthralling.The plot, while slow, was just as remarkable as the rest of the book. The story seems to be loosely based on Sleeping Beauty and it was more than fitting for the heart of the story. Sand was earnestly repairing the castle piece by piece and it made everything seem bleaker than before. It seemed like he had no more hope to get out of the castle after his first attempt and when Perrotte showed up, things got a little brighter, if not even more hopeless with two instead of one person trapped. There was always a constant worry of starving to death or never leaving the confines of the living brambles and it was…sad how quickly they adjusted to life in the broken castle. But the plot is definitely enrapturing and I loved every moment of it, especially near the end when Perrotte remembers everything, remembers her life, and a new fire is kindled in her.The relationship between our two characters is sparked firstly by loneliness, but their friendship takes a deeper turn. And no, I don’t mean romantically, but they start to depend more and more on each other, on their company, and it’s more than just a lack of options. It was sweet, how much they loved each other (as friends) and how much they supported and tried to help each other. Their relationship runs deeper than before the castle was sundered though, and the mystery, and revelation, had me gaping and gasping.There’s something drastically enchanting about The Castle Behind the Thorns that made me fall in love with the characters and the story and just everything. The story was mind blowing and heart warming, the magic positively enthralling. The theme behind the stories was brilliant and how the characters grew was just amazing and endearingly sweet. Honestly, this book was near perfect. And as unfair as it is (and I agree) I didn’t love it completely because I felt like I would’ve loved to see a YA version of this. I know I know. But otherwise, this book is beyond stunning! Sand is the son of a blacksmith living in rural France. Unexpectedly, he one day wakes up inside an abandoned castle and finds himself trapped there. The castle has been sundered, or split in two, and surrounded by magical thorns that attack anything that moves. Everything inside the castle has been damaged. Not knowing what else to do, Sand uses his blacksmithing skills to mend things so he can survive. Then suddenly Perrotte appears. She is the heir of the castle...and was dead, now returned t Sand is the son of a blacksmith living in rural France. Unexpectedly, he one day wakes up inside an abandoned castle and finds himself trapped there. The castle has been sundered, or split in two, and surrounded by magical thorns that attack anything that moves. Everything inside the castle has been damaged. Not knowing what else to do, Sand uses his blacksmithing skills to mend things so he can survive. Then suddenly Perrotte appears. She is the heir of the castle...and was dead, now returned to life. The two pair up, working together to not only to mend the castle, but also to figure out how Perrotte died, and why she came back to life. This is a story of friendship, faith, and forgiveness. It's nice to read a story with teenage characters that is not focused on romance. The battles that the characters face are internal, each needing to come to terms with how their life worked out and accepting what is. While some might consider it a retelling of Sleeping Beauty, I would say that is a large stretch of the imagination. Merrie Haskell seemed to only borrow the idea of a sleeping castle surrounded by thorns. Everything else is far removed from the Sleeping Beauty tale. I found this story to be very introspective. For the majority of the tale, there are only two characters in a large castle. Likewise, the story is quiet and does not have a lot of action. The ending seems to come quickly, but then there are many more characters present at the end, and it seems to mirror life in that time moves quicker when there is a bustle of activity. Sometimes middle-grade feels really juvenile, but this was not at all the case in The Castle Behind Thorns. The anger and sadness Perrotte feels about what happened to her added a layer of darkness and matureness I was not expecting. Unexpected but awesome. This book raises some interesting questions about forgiveness, which I liked. Making the reader ponder a moral dilemma helped with the whole "more mature thing". This doesn't mean the material is unsuitable for younger readers of course. I'm just saying it will make the book more enjoyable for older readers such as myself (although I'm not that much older than the intended age group. I'm almost 16). Also, I like that there's no romance! The emphasis is on the friendship between Perrotte and Sand. Just a few minor complaints. For one, sometimes the world-building is a little unclear. Also, I was never quite sure how or why Perrotte came back to life. Or was she ever really dead? I'm a little confused. I feel like this could use a sequel, to wrap up those loose ends. So I found a good author and kept reading. This third book by Haskell is the best yet! This time the setting is medieval France and loosely based on Sleeping Beauty. At least the beginning of the story reminds the reader of Sleeping Beauty. But don't expect things to develop like that fairy tale. This story is its own and it is fascinating in my opinion. I loved Haskell's exploration of forgiveness and restitution in this book! I didn't expect it, but it is powerful, metaphors and all. Haskell h So I found a good author and kept reading. This third book by Haskell is the best yet! This time the setting is medieval France and loosely based on Sleeping Beauty. At least the beginning of the story reminds the reader of Sleeping Beauty. But don't expect things to develop like that fairy tale. This story is its own and it is fascinating in my opinion. I loved Haskell's exploration of forgiveness and restitution in this book! I didn't expect it, but it is powerful, metaphors and all. Haskell has a way with words and with characters. She creates good tension and action and backs it all up with themes that have real substance. I really liked the interaction of the two main characters. I also liked the twist at the end--quite appropriate. I found the author's intertwining of medieval theology and magic quite interesting. Perhaps she is equating religion with magic, but I think it may be more a comment on the way medieval people viewed religion. Their belief in the power of relics, saints, and miracles almost sounds like magic to our modern society. But it was very real to them. Rose, and any other friends who have read this book, what do you think about this last point and the author's possible intent? Take the idea of Sleeping Beauty - a castle surrounded by a forest of thorns, a princess waiting to be awakened, a young man ... - place it somewhere in France (actually, it's much more precise than 'somewhere' but I don't know any French geography and haven't gone to an atlas to check it out) not too long after the time of Joan of Arc, and then turn everything else on its head, and you've got this book. The lad wakes up in the cold ashes of a huge fireplace. How did he get there? He's inside the Take the idea of Sleeping Beauty - a castle surrounded by a forest of thorns, a princess waiting to be awakened, a young man ... - place it somewhere in France (actually, it's much more precise than 'somewhere' but I don't know any French geography and haven't gone to an atlas to check it out) not too long after the time of Joan of Arc, and then turn everything else on its head, and you've got this book. The lad wakes up in the cold ashes of a huge fireplace. How did he get there? He's inside the Sundered Castle, the deserted castle looming on everyone's horizon but that nobody talks about or even generally thinks about. Everything inside the castle has been broken, not as if shaken in an earthquake but as if ripped into pieces. After unsuccessfully trying to get out past the thorns, Sand sets about to survive.